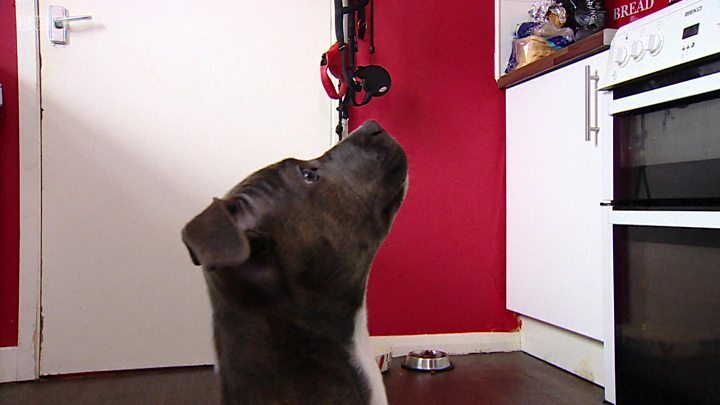 The PSDA vet who has been caring for Macie since her operation said she was "extremely lucky to survive". 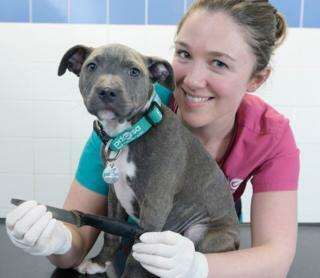 Media captionA puppy who swallowed an 8in kitchen knife is recovering after life-saving surgery. She said: "Macie was making a squeaking sound - I thought she'd swallowed part of a toy. Then she was sick, but there was no sign of a toy, and she started choking. "I was terrified. Poor Macie was still choking and, by the time we arrived at the vet's, there was blood coming out of her nose. The loss of our previous dog was still very raw and the thought of losing Macie was devastating." PDSA vet Emily Ronald, said: "I've never seen an X-ray like Macie's. She was extremely lucky to survive. Her saving grace was that she swallowed the handle-end first - the blade-end would undoubtedly have pierced her organs, likely causing fatal injuries. "The morning after surgery, she was bouncing all over the place as if nothing had happened. Macie has been back for frequent check-ups over the past two weeks and we're pleased she's recovering and healing well." Ms Paisley added: "I couldn't believe it when they said Macie had swallowed a knife. I have no idea where she got hold of it - she could have pinched it out of the dishwasher, but no-one saw what happened. None of us could sleep that night as we knew Macie might not survive." She added: "Although she's only young, Macie is already a big part of the family. She brings us so much joy and happiness, and means the world to the children. Without PDSA, she wouldn't have received her life-saving treatment and wouldn't be here today." Over the years, the charity's vets have removed items including tent pegs, golf balls, radio aerials and rubber ducks during surgery on pets.